When you spend $50 or more (before tax & shipping) you get your choice of the Hope Dragonfly Key Chain or Hope Dragonfly Scarf at 50% off. Hope Dragonfly Key Chain On the wings of Hope! Silver hardware with epoxy-filled coral dragonfly features the word HOPE spelled out in the wings. Make a difference! $2.50 from the sale of this Hope design goes directly toward research at the Huntsman Cancer Institute. 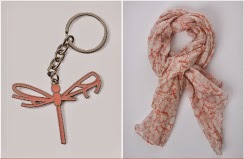 Hope Dragonfly Scarf Light cream fabric features a custom print in shades of coral, with the word “HOPE” spelled out in each flitting dragonfly’s wings. Make a difference! $5 from the sale of this Hope design goes directly toward research at the Huntsman Cancer Institute. Dimensions: 72” x 40”. 100% Polyester: hand-wash only; lay flat to dry.